Son of whaler Arnold Hazell of Bequia, Anthony Hazell, brother of Chief Whaler of Barrouallie Samuel Hazlewood, teacher and fisher Winston Hazell and fisher and tour operator Kirk Grant of Barrouallie just returned to St. Vincent after attending a naturalist workshop organized by Whale and Dolphin Conservation and Fundacion Cethus in Boston, Massachusetts. Besides the 2-days workshop, they also participated from two different whale watching tours and visited a whaling museum in New Bedford, a coastal city which moved from whaling to whale watching. Son of whaler Arnold Hazell of Bequia, Anthony Hazell, brother of Chief Whaler of Barrouallie Samuel Hazlewood, teacher and fisher Winston Hazell and fisher and tour operator Kirk Grant of Barrouallie just returned to St. Vincent after attending a naturalist workshop organized by Whale and Dolphin Conservation and Fundacion Cethus in Boston, Massachusetts. 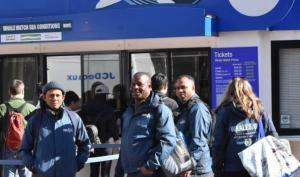 Besides the the 2-days workshop, they also participated from two different whale watching tours and visited a whaling museum in New Bedford, a coastal city which moved from whaling to whale watching. While out whale watching the gentlemen were able to see Sei, Right, Fin, Minke and Humpback Whales. Excited to talk about what he experienced Kirk Grant said: “We can make a lot of money and help the economy. From January to December in Boston Harbour they make 16 million dollars from whale watching. We were some 17 miles offshore of Boston when we saw humpback whales, right whales, sei whales and fin whales. It’s a good move for St. Vincent if we can get more whale watching. We can start form small businesses and become one of the best whale watching places in the Caribbean because we have a lot of cetaceans. As fishermen we go out about two miles off Barrouallie and we see whales pass going nort. We have seen orcas, humpbacks, pilot whales and many dolphins.” According to Winston Hazlewood he said we have to package a naturalist tour, so that if you don’t see whales you will see dolphins and birds. “I have experience with Spinner dolphins that they are so tame that you can reach over and touch them with your hands. They go up in the air and spin around 4-5 times. They are amazing to watch.” Hazlewood wishes more students can experience whale watching in St. Vincent. He also noted that the FADs (fish aggregating devices) put down by Fisheries attract whales, especially the sperm whale. These make it easier for one to be able to see a whale. This visit to Boston comes as part of the educational program being run by Fundacion Cethus in Bequia and Barrouallie, funded by the SVG Preservation Fund among other institutions. Coordinator of the SVG Preservation Fund Louise Mitchell noted that she is pleased that the trip was a success and persons from whaling communities saw first hand that whale and dolphin watching is not only exhilarating but economically exciting as a new industry for coastal communities of St. Vincent.